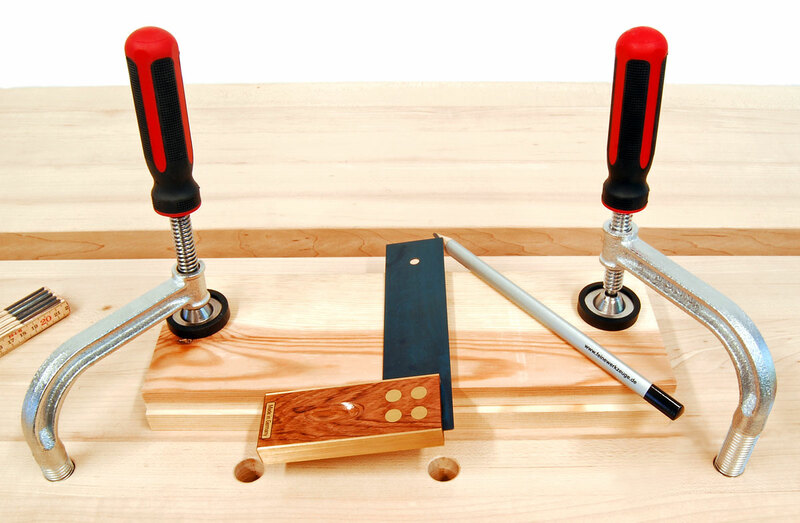 Get a quick, firm and fuss-free hold on workpieces on your work table or workbench! 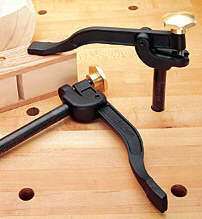 It is easy to do with these types of clamps, known generally as holdfasts. They insert into a round hole in the work surface, and with a thumbscrew or a simple tap with a hammer or mallet will hold a plank, jig, or various table-top tools and stands, just about anything, as if it had been nailed in place. These kind of clamps are produced in Canada and the USA. Because they are made mostly for the American market, they are sized in inches. One inch equals 25.4 mm. They are designed to be inserted into holes with a diameter of 3/4 inch. 3/4 inch is 19.05 mm. But it doesn’t really matter whether you make your holes 19 mm or take the trouble to find a 3/4 inch drill bit: the tiny difference in diameter will make no difference at all when using these bench clamps. All of these tools are made slightly under diameter so they will not bind in the holes unnecessarily in use or if the benchtop swells with changes in humidity. Drill bits at 19 mm and 3/4 inch can be found on our drill bit pages. Drill Bit Pages. We have often been asked if these holddowns and holdfasts will also work in 20 mm holes. I will say here again clearly, no! It is a bad idea to use over-size holes as the contact between the shaft of the clamps and the bench top is much reduced if there is too much play in the holes. This both reduces the available clamping pressure that is possible, and will over time damage the edges of the holes, decreasing still further the holding power of the clamps. 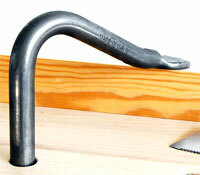 This solid, cast iron holdfast is essential for any workbench. 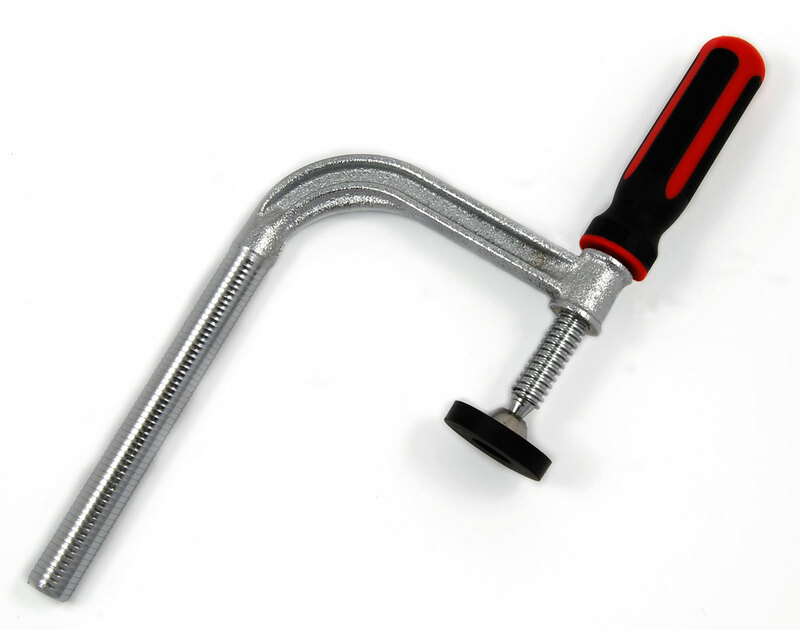 The large, ergonomic grip is made from two-component plastic. It easily yields high clamping pressure with just a few turns. The large rubber pressure plate ensures non-marring clamping of the workpiece and has a diameter of 44 mm. The fluted shaft securely fits into any 19 mm i.e. ¾ inch hole, which has become a standardized size due to wide-spread availability. It is galvanized and has a length of 155 mm. Clamping depth is 125 mm, measured from the middle of the pressure plate to the inner leg of the shaft. Maximum working height is 115 mm, when shaft immersed 60 mm into hole. Great value for money! Before the arrival of modern screw clamps, it would not have been possible to imagine working wood without holdfasts. Originally hand-forged in iron, they became scarcer and scarcer as woodworking and tools became industrialized, even though they actually are much quicker and easier to use than modern screw clamps. We have long known about these tools, and we sometimes saw various kinds of them in workshops we visited. Woodworkers would tell us that they inherited them from their relatives, or had a local blacksmith make them one. Our current supplier, Gramercy Tools in the USA started making them again a few years ago. We also found a supplier in the far East, and although we knew that those holdfasts were in cast iron as opposed to forged iron or steel, we thought they would be strong enough to do the job. Wishful thinking! It was of course a disaster, and so we quickly took them off of our site and stopped selling them. Now we are very happy to be able to offer these excellent, forged steel holdfasts. They are very durable, should never need to be replaced, and it is difficult to believe how fast you can hold down and then release a work piece. A tap with hammer or mallet on the top, and the workpiece is held. A tap on the back of the shaft, and the holdfast releases the piece. With many workpieces, using two holdfasts is recommended - this is especially important with longer boards, where more lateral support is needed because of the leverage can exert too much force for the holdfast. Maximum clamping 7-1/4 (190 mm) in a 2 inch (50 mm) thick benchtop. This is an excellent hold-down clamp. Just insert the post into any 19 mm (3/4 inch) hole until the arm touches the workpiece, then throw the hardened steel cam lever to simultaneously clamp the work and wedge the post in place. Fine barb-shaped ridges prevent upward movement when the post is canted, while still allowing easy entry into a hole. To release it, you simply flip the lever back. The forged steel arm has a low-profile clamping end, allowing good access to work from all sides. To improve grip and protect the surface of the workpiece, an optional leather pad is included that can be attached to the end of the arm. 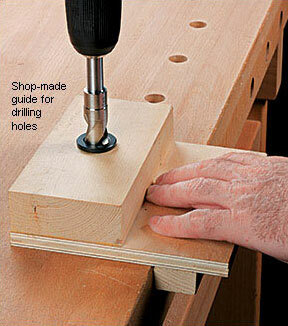 Anywhere where you can drill a 3/4 inch-hole you can use the VERITAS Hold-Down. 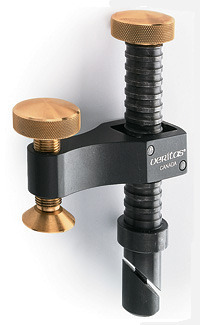 Clamping pressure is variable depending on how much you turn the brass knob. For use in holes where through travel is limited, this retrofit shorter hold-down post (B) is available separately. It provides about 100 mm (4 inch) of clamping capacity. 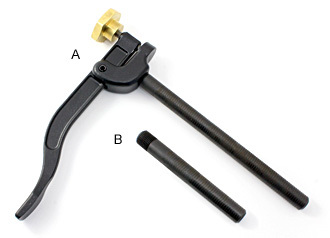 This fast-acting surface clamp can be used anywhere you can drill a 3/4 inch (19 mm) diameter hole. The post has a wedging mechanism that anchors it firmly (horizontally or vertically) in material as thin as 5/8 inch (16 mm) (depending on the strength of the material), making it ideal for use in jigs and fixtures, e.g., sliding tables for saws. The clamp arm (which slides easily on the post when tilted, but locks at 90°) has a 2-1/8 inch (54 mm) throat depth and can grip anything from veneer to material up to 3 inch (76 mm) thick. Anchor wedging is controlled by the brass knob on the post and clamping pressure by the knob at the arm tip. Used horizontally, the post collar acts as a material support. Used vertically, the collar is a rub ring that protects workpieces from accidental damage by the post rings. Precision machined from brass, steel and anodized aluminum, this is a versatile work support and clamp. These 19 mm hardened steel bushings help you make an accurate dog-hole drilling guide using any 38 mm (1-1/2 inch) thick board. Knurling on the bushing provides a mechanical lock when installed in a 25 mm hole, and a projecting rim ensures that it rests perpendicular to the jig's surface. If you don't already have a bit in the required size, we offer a 25 mm forstner bit that is 90 mm long overall. For drilling the dog holes, we offer 3/4 Inch (19 mm) drill bits that are 190 mm long overall, enough to go through the jig and a thick bench top. The lipped brad-point style scores the perimeter of the hole for clean entry and smooth sidewalls.